A Soldier’s Story about One Day in Battle - Website of Glens' Association! Private James Allan William (Bill) Whiteacre reached the 1st Battalion. Stormont, Dundas & Glengarry Highlanders (The Glens), 9th Canadian (Highland) Infantry Brigade, 3rd Canadian Infantry Division while the unit was in Nijmegen, The Netherlands. In the days that followed, he was awarded the Military Medal for his actions after The Crossing of the Rhine and suffered wounds during the liberation of Leesten, The Netherlands. Following the Second World War, Bill studied law at Osgoode Hall and was later appointed a Queen’s Counsel. 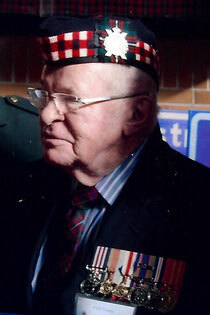 He served in the Canadian Army (Reserve) and retired with the rank of major. He has maintained a continued interest in his first regiment – The Glens. This story is Bill’s recollection of the action of his unit, The Glens, and others in the Battle of the Rhineland, and it was the basis of a talk given to the Arts and Letters Club of Toronto when the club marked the 60th anniversary of VE-Day. It covers only one day of his life as a soldier in combat. To set the stage for this story, The First Canadian Army faced a difficult and disagreeable battlefield in The Battle of the Rhineland. The front was about 20 miles wide between two major rivers – the Maas and the Rhine. While each of the rivers had defined, navigable channels, they were flanked by a wide flood plain that provided obstacles to movement. The land included two wooded areas – the Reichwald and the Hochwald. The final objective was a line between Xanten and Geldern in preparation for the crossing of the Rhine. The offensive was divided into two operations – Veritable from 8 to 21 February 1945 through the area of the Reichwald and Blockbuster from 26 February to 10 March 1945 through the Hochwald. Bill Whiteacre’s story takes place at the start of Operation Blockbuster. The degree of difficulty of these operations is obvious with the Canadian losses during the Battle of the Rhineland - 379 officers and 4925 other ranks. The heavier portion of the losses was incurred in Operation Blockbuster with 243 officers and 3395 other ranks. Major Whiteacre did not confine his talk to his unit. By using the title “Valour by Day, Audacity by Night”, it becomes a story of the actions of units in the 8th Canadian Infantry Brigade as well as the 9th Canadian (Highland) Infantry Brigade on that one day – the 26th of February 1945. It starts with the activities of the 8th Brigade on the opening day of Operation Blockbuster clearing the way for the 9th Brigade to assault the fortified Town of Udem - the jewel in the crown of the Northern Siegfried defences. I believe the reader will appreciate Major Whiteacre’s use of the words “valour” and “audacity” in the title of his talk. Valour and audacity were both present on 26 February 1945. I am sure that he also covered the activities of both brigades to emphasis his concluding remarks. Major (Retired) J. A. William Whiteacre MM, CD, QC. On start of Operation Blockbuster on the 26th of February 1945, 214 young Canadians died in action, the highest single day’s toll after D Day and the closing of the Falaise Gap. Before Blockbuster was finished, and the last Nazi was driven from west of the Rhine, 3,638 young Canadians would be killed in action. “Blockbuster’s outcome is reminiscent of the muddy fields of Passchendaele and the shell torn slopes of Vimy Ridge, a struggle to the death between Canadians and Germans of equal valour, equal attack, and equal counter-attack”. In the twelve years between 1933 and 1945, Hitler constructed what he called the “West Wall”, and what we call by the nickname “The Siegfried Line”. In its most northerly area, The Siegfried Line took the form of a series of fortified towns. The fortified Town of Udem is situated about 10 miles west of the Rhine River and about 15 miles south of the City of Cleve. In September of 1944, Montgomery’s Operation Marketgarden, immortalized in the movie “One Bridge Too Far”, had left us with a foothold in Nijmegen in east central Holland. 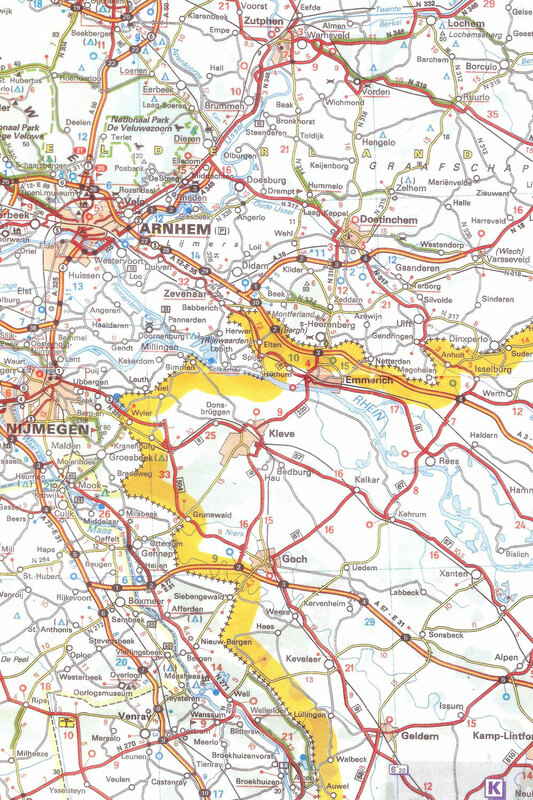 South of Nijmegen lay the German Rhineland, still Nazi held. From September to November 1944, the Canadian Army cleared both banks of the Scheldt Estuary to allow much needed supplies of ammunition, gasoline and food to be brought into Antwerp, which was then the world’s third largest port. The supply effort paid off and on the 8 February 1945, the Spring offensive to clear the enemy from all points west of the Rhine River started. But, the Nazi’s had anticipated our attack and blew the dykes on both the Rhine and Maas Rivers, flooding our military objectives. We had anticipated they would do that, and the Canadian Army was able to advance, using amphibious vehicles called BUFFALOS and succeeded in capturing the key City of Cleve. The flooding did, however, disrupt the main thrust of the Spring offensive (Operation Veritage) and a new offensive called Operation Blockbuster had to be mounted, on the 26th of February, using the highway from Goch to Calcar as its startline. The object was to capture, that one day, the fortified town of Udem. The 8th Brigade consisting of the Queen’s Own Rifles of Toronto, The North Shore Regiment of New Brunswick, and Le Regiment de la Chaudiere , from the Beauce area of Quebec, were to clear the five mile approaches to the fortified town. The three regiments of the 9th Canadian (Highland) Brigade led by “B” Company, my Company, of the Stormont Dundas and Glengarry Highlanders from Eastern Ontario was to assault the fortified town of Udem itself. We had five major problems. 5. Unknown to us was the fact that the paratroop defenders of Udem had stealthily moved forward and set up undetectable positions in the hamlets of Mooshof, Keppeln, Felmanshof and Hollen some two to three miles to their front. These moves may have taken place as late as the day before the assault. At 4:40 am, on 26 February in the driving rain, two companies of the Queen’s Own Rifles, crossed the Goch-Calcar Highway startline. One of them was to capture the hamlet of Mooshof. The defence overprint showed defences as of a week before 26 February. Mooshof appeared to be defenceless. The Queen’s Own were without tank support, although a squadron of the Canadian 1st Hussars had been assigned to support them. They used artificial moonlight, huge searchlights which bounced their light off the low lying clouds. The trouble was that artificial moonlight was not bright enough to allow the safe use of tanks but was bright enough for the complete loss of the element of surprise. As “D” Company, on the left, under the command of Major Ben Dunkelman of Toronto, approached the hamlet of Mooshof, the defending Nazis sprung their trap and opened withering machine gun, mortar and very accurate artillery fire on them. One whole platoon was wiped out and the remainder of the company was pinned down and couldn’t move either forward or back. At first light, the tanks could be used and some of them moved forward to rescue the pinned down riflemen. Aubrey Cousins personally killed 20 Nazis and took prisoner another 20. After the Hamlet of Mooshof had been largely secured, a sole remaining sniper got his revenge. Aubrey Cousins was shot through the head and died instantly. The time was 8:30 am. He had been fighting unremittingly for about four hours. For his actions on the 26th of February 1945, Aubrey Cousins was posthumously awarded the Victoria Cross (VC). It was the first VC to come to the Canadian Third Division, even though they were the first Canadians to land on D Day and the only Allied Division to reach its objective on D Day. The day’s fighting had cost the regiment 37 killed in action and another 64 wounded. The second unit into battle that day was the North Shore Regiment from New Brunswick under the command of Lieutenant Colonel John Rowley of Ottawa. Their objective was the hamlet of Keppeln, two miles north of Udem. The defence overprint dated a week before the 26th shows Keppeln to be defenceless. At 8:45 am, the soldiers of the North Shore moved forward, but it wasn’t until nightfall that Keppeln was completely taken. 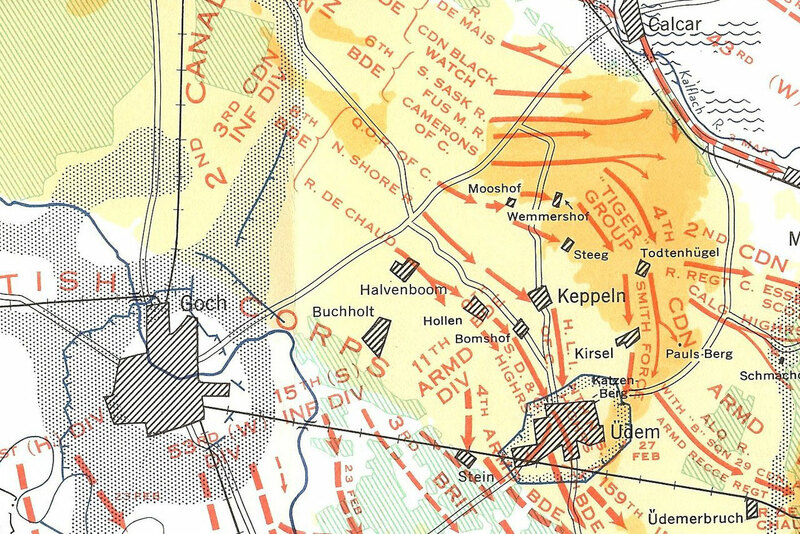 As Keppeln was believed to be only lightly defended, all tanks had been assigned to support either the Queen’s Own on the left or Le Regiment de la Chaudiere on the right. There were none assigned to the North Shore. The well concealed enemy held their fire until the New Brunswickers were only 150 yards away. There were ten concealed Nazi tanks and self- propelled guns in Keppeln surrounded by equally concealed machine gun nests. No advance could be made without tank support. The thirteen surviving tanks of the Canadian 1st Hussars which had so famously been supporting the Queen’s Own at Mooshof had to refuel, replenish their ammunition, and cross 1,800 yards of open ground to reach the North Shore position. It wasn’t until 2:15 pm that the tanks under the command of Major John Powell were able to reach the New Brunswickers. Colonel Rowley, known to his men as “The Good Shepherd” because of the long staff he habitually carried, worked out a revised plan with John Powell. The plan was that some of the soldiers of one of the reserve companies of the regiment would cling to the outsides of the tanks and then sweep around the position of the two pinned down companies toward the Nazi guns. The leader of the small army of 42 tank-clinging soldiers was Lieutenant Harry Nutter. This is a dangerous tactic because with soldiers clinging to the outside of a tank, the turret cannot be turned, and so it can defend itself only from what is straight ahead. The dicey tactic worked. As Harry Nutter and his tiny band moved forward on the tanks, another reserve company of the North Shore followed at a run, as did the surviving soldiers of the two pinned down companies. Keppeln was captured, but at a heavy price. Twenty-one New Brunswickers were killed in action, another 61 were wounded, and three were missing in action. In their support of the infantry both at Mooshof and at Keppeln, the 1st Hussars lost nine tanks to enemy action and a further four were bogged down in the mud. For his actions on 26 February 1945, John Powell, who already held the Military Cross, was awarded the Distinguished Service Order. He was recommended for the Victoria Cross for his actions at both Mooshof and Keppeln, Perhap it was turned down because the army did not like giving two Victoria Crosses in one day. John Rowley was also awarded the Distinguished Service Order. Less than a month later, he was killed leading the North Shore Regiment in the crossing of the Rhine River. Harry Nutter was recommended for the Military Cross, but that too was turned down. Perhaps there was just too much bravery for one day? While the North Shore Regiment was still pinned down in Keppeln, Le Regiment de la Chaudiere started its advance on several hamlets including the hamlet of Hollen some 500 yards to their right and dominating the Cleve-Udem road. Again, the defence overprint, made a week before the 26th showed Hollen to be defenceless. The original plan was for Hollen to form the startline for the Stormont, Dundas & Glengarry Highlanders’ assault on Udem, some 2,000 yards ahead. As it turned out, Hollen was defended by troops of the 6th Nazi Paratroop Division. The battle plan of Lieutenant Colonel Taschereau, the Chaudiere’s commander, called for two bounds. The first by A and B Companies was to advance 400 yards and capture of the hamlet of Felmanshof and then C and D Companies were to pass through them and assault the hamlet of Hollen itself. With support from tanks from the Canadian 1st Hussars, they crossed the start line at 8:45 am with B Company under the command of Captain Robert Rochon on the left. B Company encountered withering fire, not only from the hamlet of Felmanshof ahead, but also from the still powerful defenders of Keppeln to the left. Rochon’s men went to ground, dug in and set up their own intense fire against the hamlet defenders ahead. Their fire was so rapid and accurate it allowed A Company under the command of Lieutenant (acting Captain without pay) William Atkinson to assault Felmanshof, and after a period of hand to hand fighting, the hamlet was captured. With the North Shore still engaged in battle in Keppeln, D Company of the Chaudieres advanced on Hollen. When its troops were within 100 yards of the outskirts of the hamlet, something strange happened. Several Nazi paratroops emerged from behind a building carrying white flags. But as The Chauds prepared to accept their surrender, suddenly three panzer tanks rounded the same building and opened fire on the surprised Chauds inflicting heavy casualties on them. They quickly went to ground and, as best they could, began to dig in. The Chauds couldn’t move forward or back and had to stay in that position suffering more casualties as the Nazis pummeled them with mortars. Finally, the turning of the tide in Keppeln relieved some of the pressure and C Company made a combined tank and infantry assault on the Hollen defences. At first, the assault went well. The lead platoon led by Sergeant Roger Chartrand gained its objective thus allowing one of the reserve platoons to pass through. But they were quickly pinned down and decimated by heavy and accurate fire coming from a partially concealed machine gun nest. Rochon then led his platoon in a magnificent dash across open ground and engaged in hand to hand fighting with the machine gunners, killing them and taking their position. This allowed the badly depleted troops of A and B Companies to pass through Chartrand’s position. And led by the resilient Captain Robert Chartrand and Acting Captain William Atkinson, they assaulted the remaining defenders of Hollen. Just a half a mile ahead and straddling the Cleve-Udem road lay the hamlet of Bomshof. Incendiary artillery rounds had ignited every building in the hamlet so the indefatigable Chauds exploited their success in Hollen and moved the half mile forward. This allowed The Glens to move their start line right up to just north of the Bomshof inferno. The price for the capture of Hollen was heavy. Seventeen Chauds were killed in action, another 51 were wounded, but 224 Nazi Paratroopers were taken prisoner. And most importantly, the start line for The Glens assault on the fortified town of Udem was secure. For their actions on the 26 February 1945, Captain Robert Rochon and Acting Captain William Atkinson were each awarded the Military Cross. Sergeant Chartrand, who had shown extraordinary leadership to his troops from D Day on, was awarded the Distinguished Conduct Medal. Unfortunately less than two weeks before VE Day, Robert Rochon was killed in action. William Atkinson returned to Canada with the regiment and later became its commanding officer with the rank of Lieutenant Colonel. The highlight of his command was when the newly crowned Queen Elizabeth agreed to become the regiments Colonel-in-Chief. My report on La Regiment de la Chaudiere would not be complete without mention of their Padre, Father Jean Dalcourt of Rimouski Quebec. Early on the morning following the taking of Hollen, he was using a Universal Carrier to collect the bodies of his dead soldiers from no man’s land. The Carrier ran over an anti-tank mine, and the much loved Father Dalcourt was instantly killed. Although flames were still leaping skyward from all of the buildings on both sides of the road running through Bomshof, and although the North Shore Regiment was still clearing the last holdouts from Keppeln, Lieutenant Colonel Roger Rowley, the Commanding Officer of the Stormont, Dundas and Glengarry Highlander, and brother of Lieutenant Colonel John Rowley, made a major change in his battle plans. The battle for Udem was originally planned to be fought in daylight with tanks. Now it had to be fought at night, and tanks were therefore unusable. But by this time, the wrath of the entire Canadian 2nd Corps Artillery was falling on Udem. Notwithstanding the disastrous use of artificial moonlight when the Queen’s Own advanced on Mooshof, Rowley called for its use by The Glens that same night. The entire Canadian Corps Artillery was directly under his command, and he told his surprised troops that they were going to march three abreast in column of route right into Udem. One of Clausewitz’ principles of war was “always have the choice between the most audacious and the most careful solution … no military leader has ever become great without audacity”. Our commanding officer was using audacity to the ultimate degree. No one was more surprised at this shocking change of plans than I. I had been shown the defence overprint of Udem several days before, because by this time I had been promoted to Private, Acting Corporal without pay. One of the other Corporals looked at the map and went berserk “We’ll all be killed, we’ll all be killed” he kept shouting. I guess I was a bit more stoical. I just went behind the nearest barn and threw up. The whole unit had now moved up to just north of Bomshof. My platoon of my Company was in the lead, and as a Private, Acting Corporal, I was one of the three Corporals at the head of The Glens. Directly ahead of me was my Platoon Commander, and ahead of him were Roger Rowley and his Intelligence Officer. This too was unusual. The normal place for an infantry commander is half way back. But with the fluid situation caused by the change of plans, it was necessary for the brains of the outfit to be where he could see all. I could hear the voice of Colonel Rowley on his two-way radio as he directed fire from the Corps Artillery onto Udem. The simple command “Highlanders, Quick March” was given and off we went. Passing between the inferno of Bomshof’s buildings by oneself would have been a scary event, but as part of a whole regiment marching at full parade pace right through the centre of the flaming hamlet made it both scary and thrilling. As soon as we passed the last of the flaming buildings of Bomshof, I heard Roger Rowley give the further command “FIRE” and almost immediately artillery shells started falling and exploding in the area just in front of us. Just as I felt we were marching right into our own exploding shells, I heard Rowley give the command “UP A NOTCH” and the exploding shells moved a little further ahead of us. This process continued as we moved down the road toward Udem. It is called “Fire and Movement”. We were all trained in it as it had been perfected by the Canadian Army at the Battle of Vimy Ridge. As we advanced, Nazi soldiers jumped out of their foxholes and surrendered. I heard one of them say in English: “I thought you were our comrades retreating from Hollen.” As we reached the outer defences of Udem the pace increased. We passed over the small bridge over the tank trap. The next day we learned that the bridge was packed with high explosives No one had thought to set it off. Following our very close artillery barrage, we marched into the centre of the town and set up defensive positions. Right behind us were the Highland Light Infantry from Galt who had passed through the North Shore position in Keppeln. They fanned out to the left, and we fanned out to the right. The basements were still full of Nazi defenders. To extricate them, we rolled hand grenades down the basement steps. That worked. Right after the explosion, out came the Nazis. Private David Snyder was one of our Bren Gunners. He was given the task of setting up his Bren Gun with a good field of fire in anticipation of a counter-attack. The only suitable place he could find was on a sidewalk facing down the street. He built a small parapet for himself and waited. When the inevitable counterattack came, he was ready, and he drove it off inflicting heavy casualties on the enemy. But that wasn’t the end of it. They counter-attacked again this time with a Panzerfust anti-tank gun. They destroyed his parapet and wounded him, but he kept firing and eventually drove them off, inflicting further heavy casualties upon them. For his actions on the 26th of February 1945, David Snyder was awarded the Military Medal for Bravery in the Field. As dawn was breaking, we found ourselves in an embarrassment of riches. The number of prisoners we were taking was coming dangerously close to our own numbers, and the threat of more counterattacks could result in a drastic reversal of our fortunes. That is when the North Nova Scotia Highlanders arrived, passed through our position, and through the position of the Highland Light Infantry. They drove the remainder of the defenders out of the town thus securing it and relieving our anxiety over the number of our prisoners. Eventually trucks arrived and took the prisoners away for interrogation. In all we had taken over 500 prisoners, mostly from the 116th Panzer Division. Our casualties were very light. For his brilliant, audacious and highly successful assault on Udem, Roger Rowley received no formal recognition. Perhaps it was because he had previously won the Distinguished Service Order twice. He stayed in the peacetime army and eventually retired with the rank of Major General. As I was preparing for this talk, I considered what lessons for us today could be derived from the events of the 26th of February 1945. Here we had soldiers from different parts of Canada, of all socio-economic status, and yet, there was a single-mindedness of purpose throughout those two brigades and throughout all ranks. Would that the Canada of today could find a way to pull together the way we did on that one day, the 26th of February 1945. An advantage of Glens’ Reunions and Tours is that you get to meet great people. Some of them can be found in this website. On the 2008 Tour, I was privileged to meet a great person - John (Jack) Stevens. Below is Jack’s memoir. It was a joy to help John get his story on paper. John was Struck Off Strength on December 8, 2014 at the age of 89.